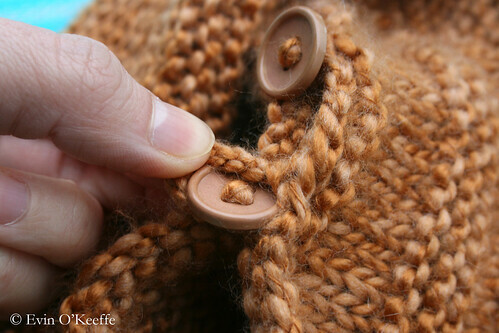 It’s amazing what goes into a hand-knit baby pullover. Several years ago, my nephew received his belated Christmas gift and to this day I still marvel at it because it was the first knitting project I made with seams! But it is also a very simple project to start with for a baby gift if you’re looking for an idea for yourself. Though I used circular interchangeable knitting needles for the project, it was done flat then seamed together. The recipe was inspired by a newborn sweater my friend was knitting and she helped me with the daunting start and proportions, I improvised heavily after that. I ended up winging the project myself with help from someone who had knitted something similar. 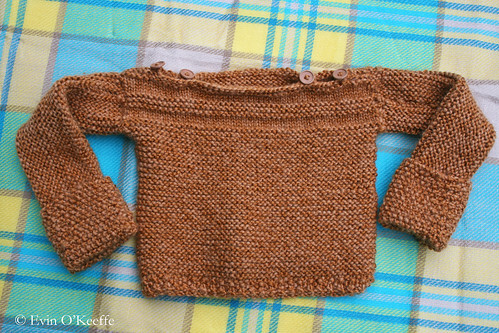 If you like the idea of knitting a baby sweater flat them doing the seams, check out Jill’s Quick and Easy Newborn Sweater. I think this is the pattern my friend used. I did not follow it only because I am stubborn and at the time wasn’t much for following patterns. The key to knitting without a pattern is knowing the gauge! Nope, I’m not kidding. I know, it takes time and feels like driving in circles when you have a big distance of highway to cover, but it’s necessary. I did a little swatch to test gauge and once I was confident I liked how it knitted up on 6mm, I calculated my cast on stitches. The first few rows were moss stitch to reduce rolling then I continued with garter stitch. When I got partway through I received the measurements for my nephew with the reality that I was very off so I had to adjust the sleeves circumference. Thankfully, I already had included 3.5-inch moss stitch sections at the cuffs for folding back as he grows. I created a nice textured stripe design on the front by the bateau neck for a bit of personality. 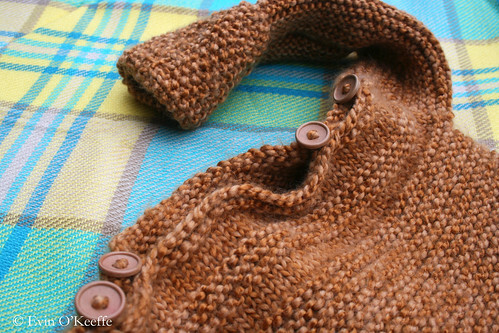 I purled one stitch between the body of the jumper and the sleeves for a seam-like appearance and better folding in that spot (less stiff when on baby). There was some adapting and making it up as I went along for the second half of the jumper, but it all worked out nicely. I ended up finishing the back with 5.5mm needles and the sleeves with 6mm (as I used for the front of the jumper and rest of the sleeves), so the back is a bit tighter gauge than the front. But as my family says, “On a galloping horse, no one will notice.” Which is so true, especially when you consider a galloping horse has nothing on a wiggling one-year-old! So what went into my nephew’s jumper? When I was muddling through the first half of the jumper, I had apprehension that it would turn into anything worth wearing. However, I reminded myself that as a one-year-old, my nephew won’t notice a stray purl instead of a knitted stitch and I am, after all, his favorite and only aunt. That thought kept me going and in spite of a few issues it is now complete! 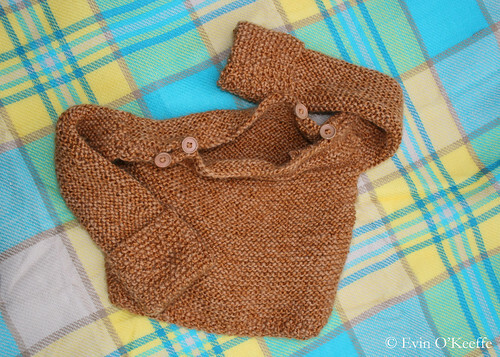 This entry was posted in Knitting | Crochet, Knitting for Babies & Kids and tagged crafts, free knitting pattern, free knitting patterns, Knitting, newborn sweater, sewing, tivoli yarn, upcycling.